It’s not always easy to eat right – we get it. With our busy on-the-go lifestyles, it’s sometimes hard to ensure that you’re getting the recommended daily intake of fruits and veggies. Eating well is important for your overall health, including your eyes, so it’s important for you to make the effort and get the things that your body needs to operate properly. Smoothies are an easy, quick and delicious way to make sure you get your daily nutrients, so here are some fruits and veggies you should be adding to your smoothies to ensure optimal eye health. Avocados are packed with health benefits, mostly known for being low in sugar and high in healthy fats, but did you know that they also contain high concentrations of lutein? One ounce of avocado contains over 81 micrograms of lutein. Lutein is a powerful antioxidant that helps prevent macular degeneration as we age and research shows that our bodies do not synthesize the lutein it needs and require us to supplement this requirement by consuming healthy nutrient filled foods. 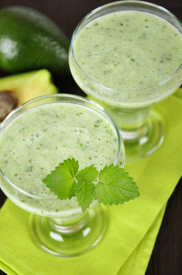 To add more avocados to your diet, try this delicious Avocado Superfood Smoothie. Directions: Slice and pit the avocado. Discard the pit and skin by scooping out the flesh with a spoon and placing it into a blender. Add the remaining ingredients into the blender, leaving two of the mint leaves as a garnish. Blend until smooth; add additional juice or water to adjust consistency. Pour, garnish and enjoy! Vitamin C: vitamin C helps to protect your body against free radicals, which can damage our eyes and lead to the development of various diseases. It also aids in eye health by reducing intraocular pressure, a common cause of glaucoma, and protects the optic nerve. Vitamin C also aids in the prevention of macular degeneration by maintaining the health of connective tissues in the eye. One cup of blueberries contains 14 milligrams of vitamin C.
Vitamin A: blueberries are also loaded with vitamin A, another antioxidant that aids in the prevention of damage caused by free radicals. Not only does vitamin A protect the eye from degeneration and disease, but it also reduces inflammation and works to relieve dryness. Vitamin E: vitamin E actively works toward the prevention of cataracts, when the lens of the eye becomes cloudy and impairs vision. Cataracts are a common problem that develops with age. Consuming adequate amounts of vitamin E can help slow this process down. Anthocyanins: blueberries also contain anthocyanins, another kind of antioxidant that is beneficial for the maintenance of eye health. This antioxidant is particularly beneficial to people living with diabetes as it can reduce damage caused by inflammation and help prevent diabetic retinopathy. Zinc: zinc is an especially important mineral as it helps our bodies absorb other vitamins more effectively. Zinc also protects our eyes from developing night blindness and macular degeneration as we age. A cup of blueberries contains 0.24 milligrams of zinc. 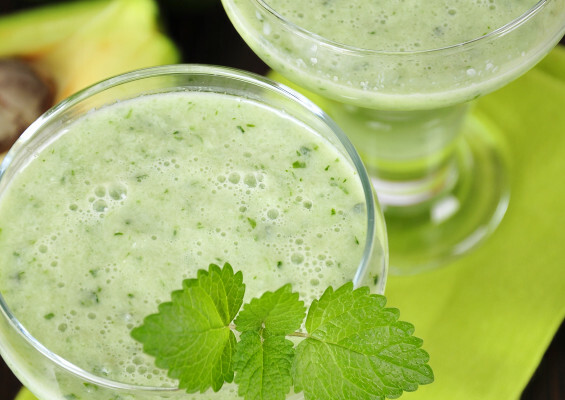 To benefit from numerous eye health benefits of blueberries, try this delicious Berry Green Smoothie. Directions: Combine all ingredients in a blender, blend until smooth. Add water to adjust consistency, add sugar to taste. Carrots, like blueberries, are great for your eyes because they are jam-packed with vitamin A. On top of being a powerful antioxidant, vitamin A helps create a barrier that protects the eye from bacteria and viruses, helping to prevent disease and infection. According to the National Eye Institute, people who consume vitamin A daily (along with vitamin C, vitamin E, zinc and copper) reduce their risk of developing macular degeneration by 25%. 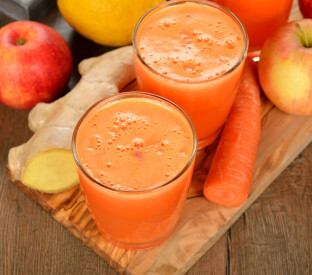 To incorporate carrots and other eye healthy ingredients like apples and ginger, try this Apple, Carrot and Ginger Smoothie. Directions: Wash, peel and chop up the carrots and ginger. Add all the ingredients into the blender and blend until Smooth. 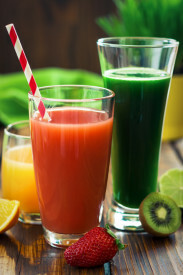 Add additional juice or water to adjust the consistency of the smoothie and enjoy. These three smoothies for eye health are not only great for your vision; they’re so delicious, you’ll be looking forward to them. For more information on eye health, contact us.